Final drive motors are well-designed pieces of equipment that provide your machine with the ability to move. However, they are relatively easy to sabotage through a little neglect! 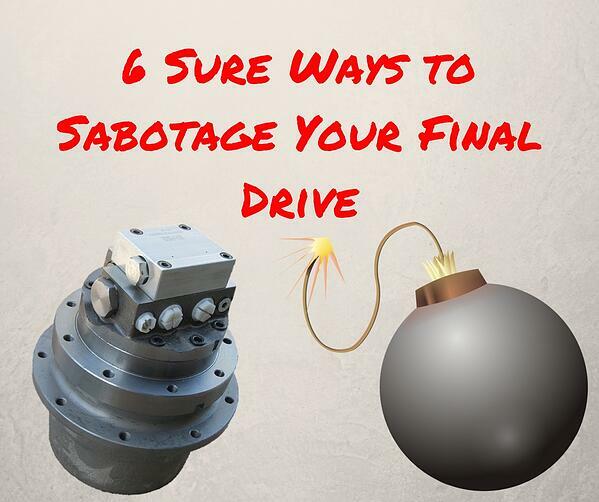 In this Shop Talk Blog post, we are going to discuss 6 sure ways to sabotage your final drive motor, including things like never checking gear oil levels and not checking case drain filters. One sure way to sabotage your final drive motor is to never check the gear oil levels. The gears and bearings in the planetary hub need lubricant (i.e., gear oil) in order to function properly. If the gear oil levels get low, then things starting going wrong very quickly. Gears and bearings will being to wear excessively, pieces of metal may begin to flake off the gear teeth, and the motor won’t run as efficiently. Parts will begin to overheat and the damage just keeps getting worse. Regularly check the gear oil levels on the planetary side of your hydraulic motor. If it's low, then top it off; if it keeps running low, then start checking for leaks. 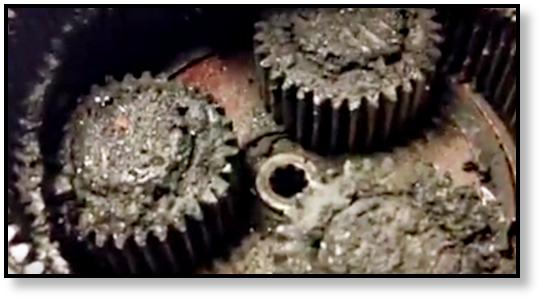 Gear oil should be checked about every 100 hundred hours. Leaks are no big deal, right? Just add some more fluid -- hydraulic fluid or gear oil, whichever is leaking. The problem is that leaks are a big deal. First, your hydraulic system is designed to run with a certain amount of fluid. When the fluid starts running too low, you are going to start seeing damage to the system. Next, if fluid can get out, contaminants can make their way in. Dirt, grease, sand, and grit will wreak havoc on your hydraulic system and your final drive motor. When you have leaks coming from the planetary side, then you run the risk of too little gear oil to keep things lubricated and running smoothly. If you spot evidence of a leak, locate the source of that leak and perform the necessary repairs right away. Ignore leaks can quickly lead to a totaled final drive motor. The gritty gear oil yous see below was the result of a leaking seal that allowed dirt and debris to get inside the gear hub. Gear oil must be changed on a regular basis. 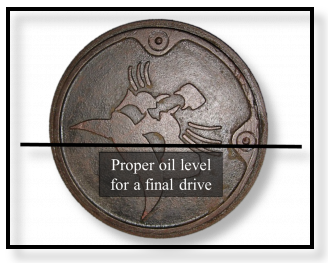 Over time gear oil naturally loses its key properties, and as it ages it simply cannot protect the gears and bearings that it is supposed to be protecting. 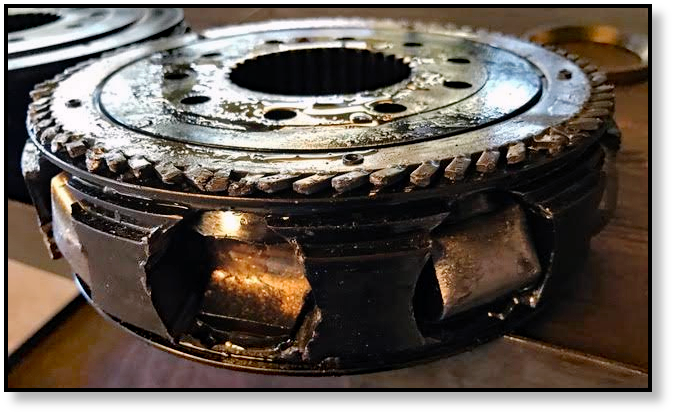 In fact, failure to change out the gear oil on a remanufactured final drive from us will void your warranty -- that's how important gear oil is to your final drive. If your gear oil looks like chocolate pudding and smells like something died, then it has been way too long between oil changes. You should change out the gear oil at least once a year. Many an otherwise good final drive has been totally destroyed because no one bothered to check the case drain filter. The case drain filter is a sintered bronze filter located on the low pressure case drain line. When it becomes clogged, pressure begins to build up on the hydraulic side of your final drive. 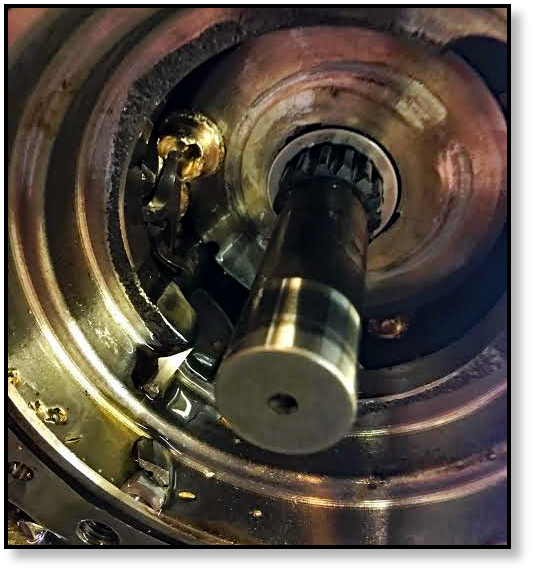 As that pressure continues to build, it will blow out the oil seal that separates the gear oil from the hydraulic fluid. That highly pressurized hydraulic fluid then enters the planetary hub. From there it may either crack the cover plate or blow it off at high speed. It also blows apart components like bearings and piston shoes -- just like you see in the picture that follows. Check the case drain filter on a regular basis, or you may destroy your final drive. Whenever you are replacing the other filters in your machine, take a few minutes to check out the case drain filter. Contamination is the number one cause of hydraulic system failure, and some final drive hydraulic motors (like Geroler or Gerotor motors) are extremely sensitive to contamination. Before opening up your final drive, make sure to clean the area of the machine where it is located. If it all possible, use a clean work surface to perform maintenance and repairs on it. Use clean plugs to close off the ports, and be careful with the hoses once they are detached. Don’t let dirt, sand, dust, metal flakes or shards, and rag fibers get into the hydraulic motor. The damage you see below started with contamination in a Geroler hydraulic motor and the level of damage just kept growing. Another great way to sabotage your final drive is to just ignore changes in its behavior. Excessive vibration, extremely hot temperatures, loss of power, and squealing noises are just few of the things you should pay attention to -- these are not normal for a final drive, and are signs that something is going wrong. Take some time to troubleshoot unusual signs and symptoms. Final drive motors represent a significant financial investment, and failure to maintain them is very unwise. Checking and change the gear oil, attending to leaks, checking the case drain filter, avoiding contamination, and paying attention to unusual behavior will help you extend the life of your final drive and get a better return on your investment.